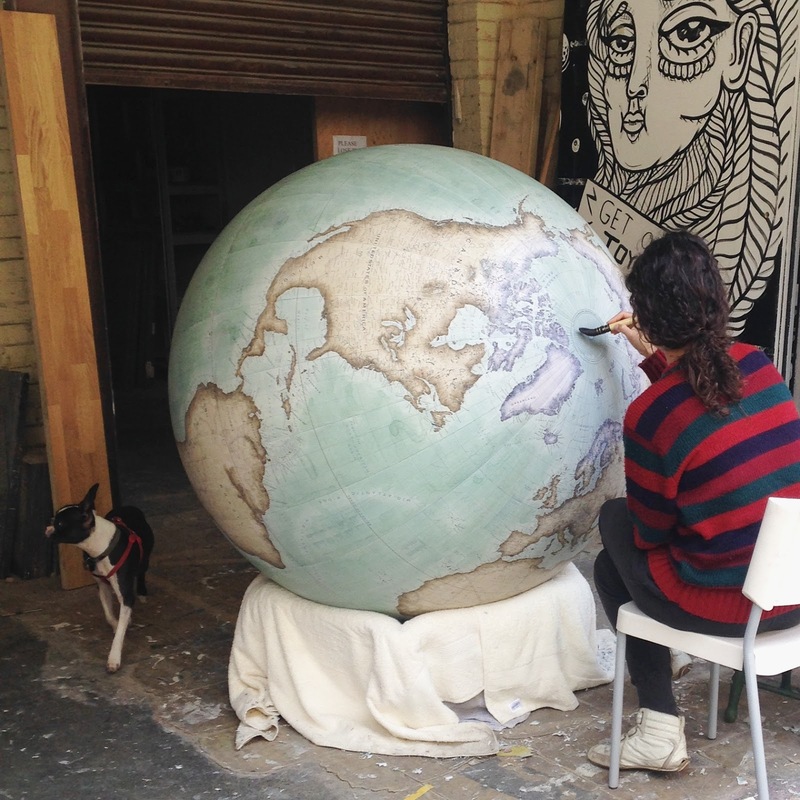 You are beholding the magnificence that is the Churchill globe, the colossal creation of Peter Bellerby and company. While marveling at images of its hand building and painting, I wondered about the relative size of things on Earth that we consider massive and how big they would be at a scale, like this, I can actually comprehend. The Churchill globe, by Bellerby & Co., measures 127 centimeters wide. 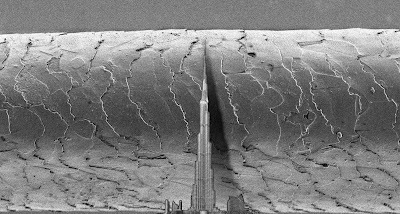 If, in the process of painting in the beautiful coastlines, one of the hairs of the paint brush fell off onto the globe, its thickness would dwarf the world's tallest building. 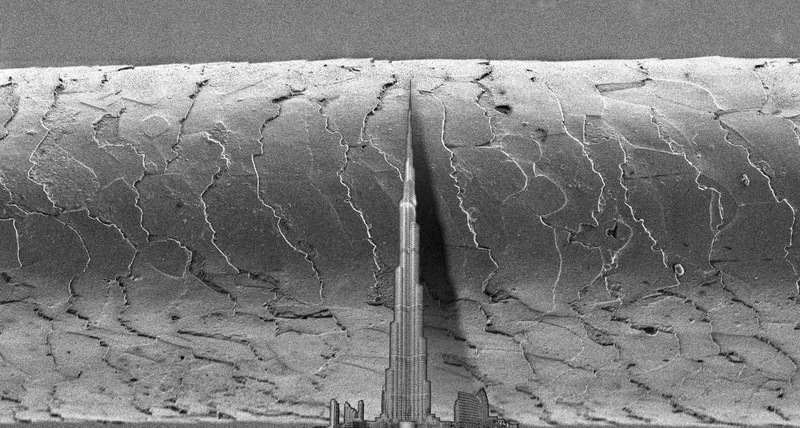 An electron microscope scan of the Burj Khalifa on the surface of the Churchill globe, with a hair for scale. The tip of Everest would reach 0.88 millimeters above the overall surface. Like two grains of salt stacked on each other, or the height of Lincoln sitting on the back of a US penny. 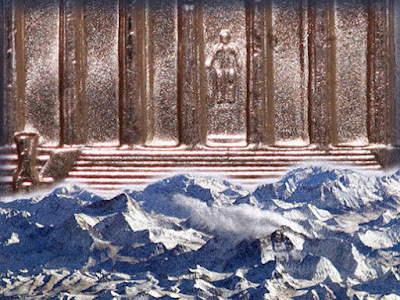 The very tip of the Himalayas would rise one Lincoln tall on the Churchill globe. The Mariana Trench's Challenger Deep, the deepest known location on the Earth's seabed, would be a 1 millimeter scratch. 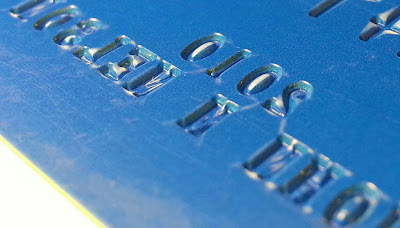 Similar to the depth of the characters punched into your credit card. The deepest location under Earth's oceans would, on the Churchill, plunge to similar depths as the characters punched into your credit card. 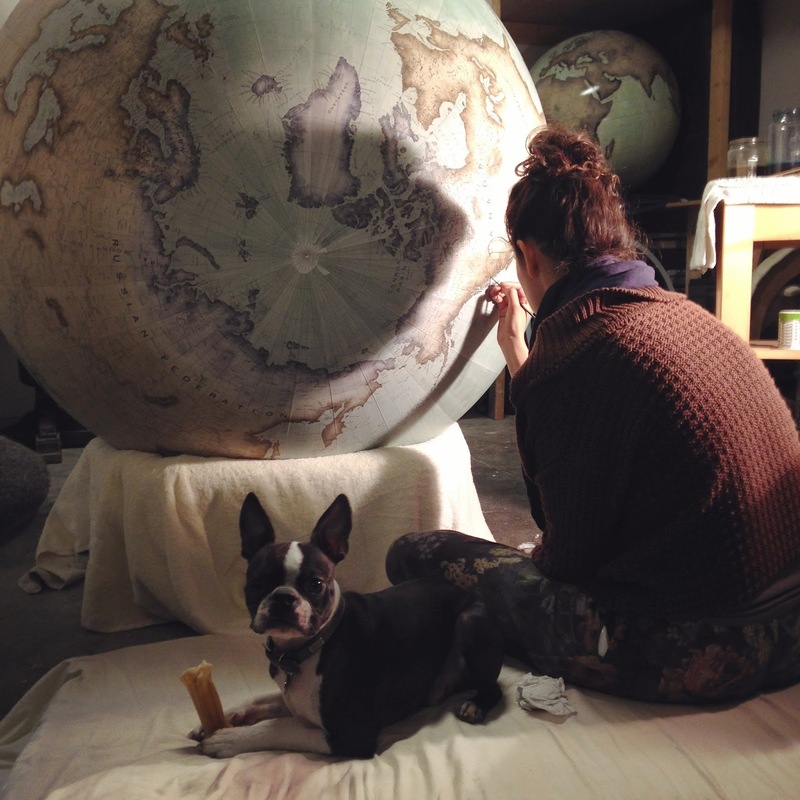 The Troposphere (pretty much what we think of as our atmosphere), where our weather and breathing happens, would be a wispy 1.2 millimeter coating -likely not much thicker than the layer of lacquer coating the Churchill globe. This makes me feel uneasy. A Boeing 747 at cruising altitude would hover 1 millimeter above the Churchill (probably suspended inside the Churchill's lacquer coating). It could fly about 97.8 cm (38.5 in) on a tank of gas. All of Earth's multi-cellular organisms would live within a tenuous 3 millimeter-thick envelope. 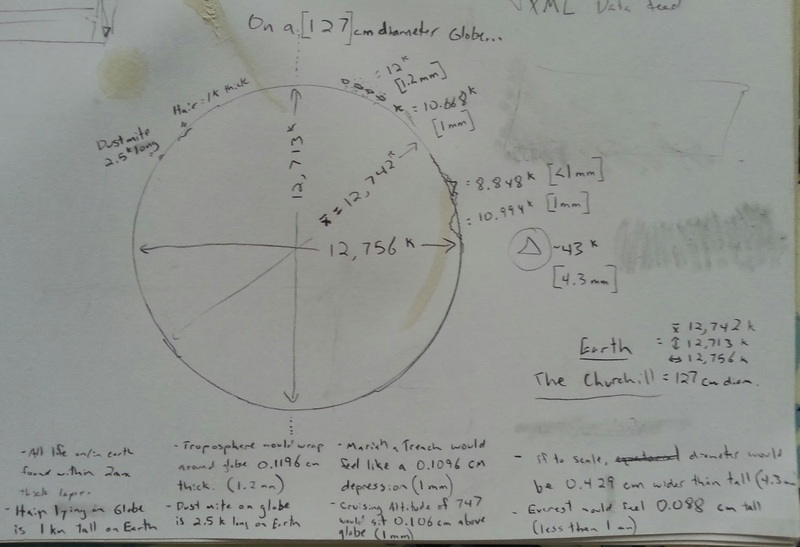 The troposphere would coat the Churchill globe about 1.2 millimeters thick. Geography nerds like to talk about how the Earth is slightly wider, generally, than it is tall, because the spinning motion mooshes it out a bit at the belt. But how much? 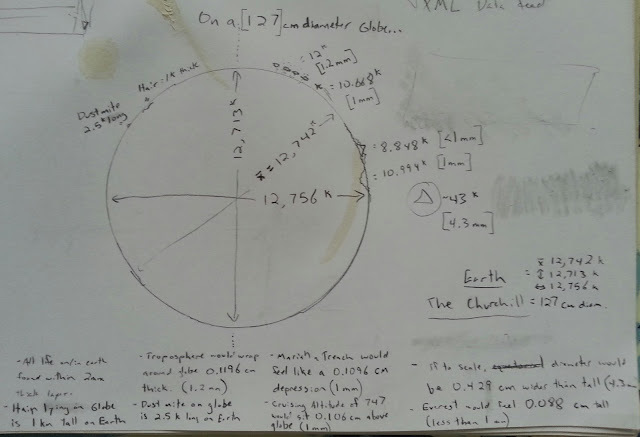 To accommodate that equatorial bulge, the Churchill globe would have to be 4.3 millimeters wider than it is tall. You could never tell by looking. 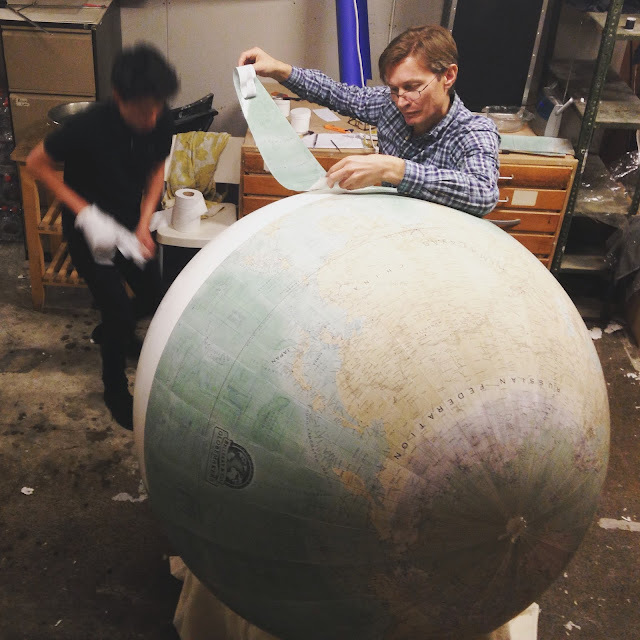 If you wrapped a string once around the Churchill globe's equator, that string would be just under one-and-a-half centimeters longer than when you wrap it around tall-ways. 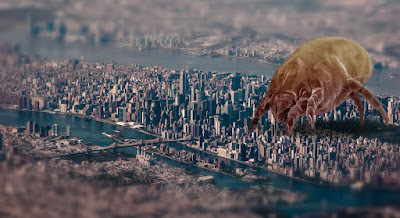 A dust mite (the invisible-to-the-eye little guys who feast on your shed skin scales) on the Churchill would be reminiscent of the Cloverfield Monster, only bigger. A dust mite on the Churchill would cover much of Central Park.